Meet Marohi whose name means strength, bravery and determination. Marohi was named by kids of Ngunguru School. Marohi was caught on 27/10/16 on Limestone Island. He had no transponder chip so is presumed to be island bred. 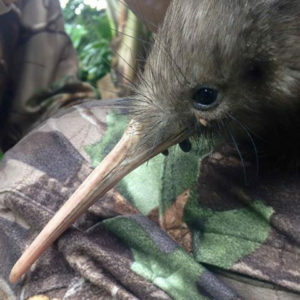 His parents would have come from the Whangarei Kiwi Sanctuary in the Purua/Riponui area where the Department of Conservation carry out predator control on three reserves and surrounding farmland. Marohi was less than a year old when released based on his weight and bill length. Weight at release: approx. 1kg. Since his release, Marohi has kept the kiwi tracking team busy with his exploits as he explores the Tutukaka Coast – perhaps trying to find a mate, or establish his own territory amongst those of the existing ‘locals’. Marohi seems content for the time being and seems to prefer pine forests to native bush. Will he establish his territory in the pines – or keep exploring the Tutukaka Coast? Will the next transmitter check reveal a nest inside one of his pine needle haystacks…? You can become a kiwi sponsor and follow the life and adventures of Marohi by signing up to the Kiwi Coast ‘Follow a Kiwi’ Program. As a Follow the Kiwi Sponsor you will receive news, updates, photos and event invites FIRST!